The Cumberland & Dumfriesshire Farmers Mart P.L.C. 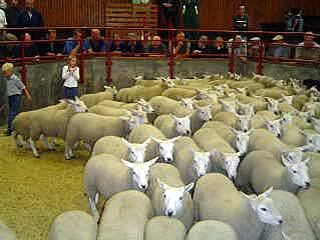 had forward 2,022 head for their Annual Sale of store hoggs and cast sheep at Longtown on Tuesday 5th January 2010. Due to the snowy conditions a smaller show that usual was forward, buyers were out in force with trade extreme. Top of £83.50 for Texels from Wanwood Hill, others £79.50 North Synton, £78.50 Hyndlee; North Country Cheviot £79.50 North Synton; Suffolk £69.80 Jury Park; Greyface £69.50 Gapshield, £66.80 North Gillbank; Blackface £66.20, £62.20, £61.50 Wanwood Hill; Beltex £61.50 Cadgillhead; Charollais £54.80 Cadgillhead; Zwartbles £50 Beechcroft; Hill Cheviot £48.50 Winterhope. Cast rams to £75.50 for a Cheviot from Over Cassock. Cast ewes to £79.50 Gatehousecote, hill types £65.50 Ruthwell Farm.